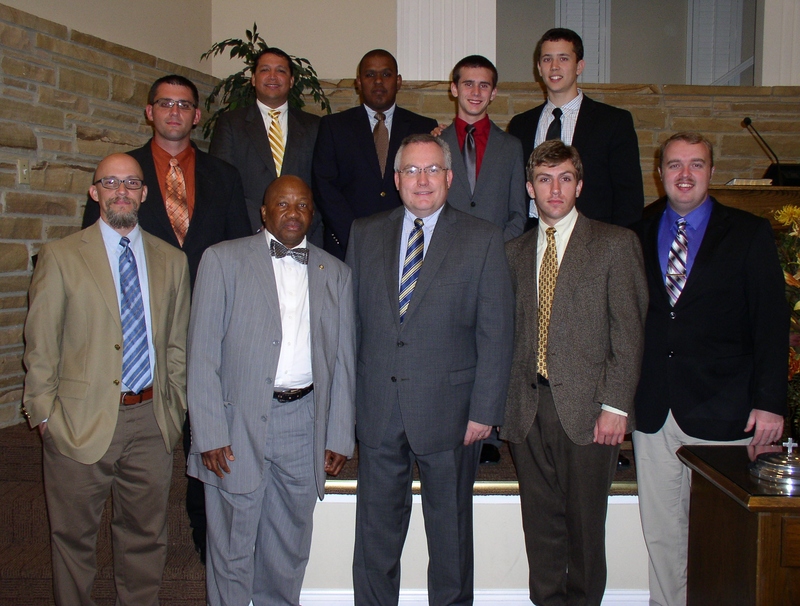 Front Row L-R: Preston Silcox, local preacher, Sao Joseph, Barry Grider, T. J. Skelton, Trent Sherwin. Back Row L-R: Josh Holloway, Efrain Aranda, Theo Scullard, Brandon Myers, Daniel Manning. MILTON, FL (BNc) — The Margaret Street Church of Christ, Milton, FL is hosting a Campaign for Christ this week, October 26-30. Twelve students from the Memphis School of Preaching, Memphis, TN are in Milton knocking doors, setting up Bible correspondence courses, home Bible studies, and inviting people to attend the Gospel Meeting each evening at 7:00 p.m. As of Tuesday evening 1,094 invitations had been extended, 21 Bible correspondence courses set up, and three personal Bible studies arranged. Barry Grider, Preacher for the Forest Hill Church of Christ in Memphis is speaking at the 7:00 p.m. worship services. The Forest Hills congregation is home to the Memphis School of Preaching. B. J. Clarke serves as Director of the school. Memphis School of Preaching, or MSOP as it is lovingly called, has 50 students who are studying to become gospel preachers. The students have come from various states, several foreign nations, South Africa, Mexico, and Panama to name a few. Before a student can graduate from MSOP, in addition to course work, he must participate in three Campaigns for Christ and one Restoration Tour. Campaigns are set up twice a year in the Spring following the school’s lectureship, and in the Fall. During the Milton, FL campaign there were three other campaigns being conducted across the country. One was in Ohio with B. J. Clarke preaching, one in Moultrie, Georgia with Jake Sutton preaching, and one in Munford, TN. Any congregation wishing to host a Campaign for Christ with the help of the MSOP students should contact Billy Bland at office@msop.org. Preston Silcox is the preacher for the Margaret Street Church of Christ, Milton, FL.